"Pimento" redirects here. For other uses, see pimento (disambiguation). Not to be confused with Pimenta. 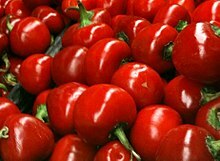 A pimiento (Spanish pronunciation: [piˈmjento]), pimento, or cherry pepper is a variety of large, red, heart-shaped chili pepper (Capsicum annuum) that measures 3 to 4 in (7 to 10 cm) long and 2 to 3 in (5 to 7 cm) wide (medium, elongate). The flesh of the pimiento is sweet, succulent, and more aromatic than that of the red bell pepper. Some varieties of the pimiento type are hot, including the Floral Gem and Santa Fe Grande varieties. The fruits are typically used fresh or pickled. The pimiento has one of the lowest Scoville scale ratings of any chili pepper. Spanish pimiento and Portuguese pimento both come from Latin pigmentum ("pigment; coloring") and came to be used for bell peppers. In Portugal and its former colonial empire, the word also came to be used for other forms of pepper, including black pepper. In Brazil, it came to mean particularly chili peppers. The English borrowed "pimiento" and "pimento" as loanwords for what is distinguished in Spanish as pimentón and in Brazilian Portuguese as pimenta pitanga. "Sweet" (i.e., neither sour nor savory) pimiento peppers are the familiar red stuffing found in prepared Spanish or Greek green olives. Originally, the pimiento was hand-cut into tiny pieces, then hand-stuffed into each olive to balance out the olive's otherwise strong, salty flavor. Despite the popularity of the combination, this production method was very costly and time-intensive. 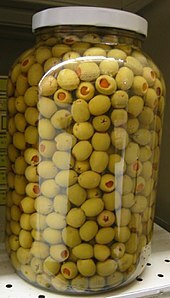 In the industrial era, the cut pimiento was shot by a hydraulic pump into one end of each olive, simultaneously inserting the pimiento in the center while ejecting the pip out the other end. More recently, for ease of production, pimientos are often puréed then formed into tiny strips, with the help of a natural gum (such as sodium alginate or guar gum). This allows olive stuffing to be mechanized, speeding the process and lowering production costs. Pimientos are commonly used for making pimento cheese. It is also used for making pimento loaf, a type of processed sandwich meat. ^ Patent description of stuffing manufacturing. ^ Pixie Sevilla-Santos. "Homemade Cheese Pimiento". Yummy.PH. Retrieved 14 April 2015. ^ "Cheese Pimiento Sandwich Spread". panlasangpinoy.com. Retrieved 14 April 2015. ^ "Filipino Cheese Pimiento". filipino-food-recipes.com. Retrieved 14 April 2015. ^ TaGa_Luto. "Inato lang Filipino Cuisine and More". bisayajudkaayo.blogspot.com. Retrieved 14 April 2015. Webster's Dictionary of the English Language – Unabridged Encyclopedic Edition, Publishers International Press, New York, 1977.